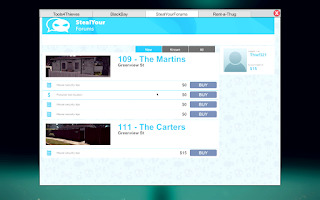 A name like Thief Simulator states exactly what one can expect from this game. 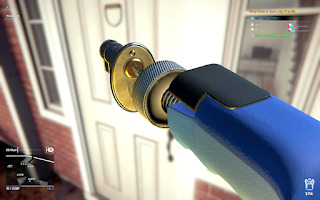 A first-person game where you take control of a thief with the simple goal of making money at the expense of others. Launching at an affordable $20 price tag with less than impressive looking trailers, does the game succeed in thievery from the purchase alone? Or is there actually some fun to be found here? Click "read more" for the full review. The story primarily exists to be a tutorial with a minor plot. 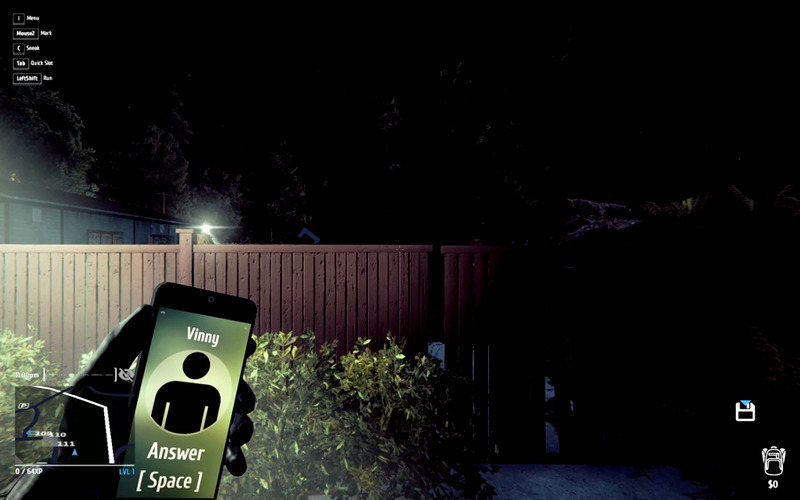 Your assassinate Vinny will call you on the cell phone and give you an objective that is usually either stealing for breaking something from a house of Greenview Street. It is always there because that is the only area to do anything thieving in. At the beginning, Vinny makes a comment about the players being bailed out of jail. 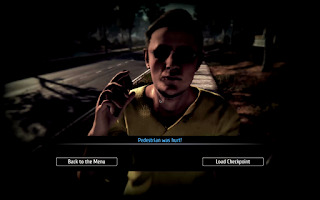 Through dialogue, it is heavily implied that all these robbery is done in order to repay that debt of bail like when Vinny uses terms such as "wage slave". Eventually, his jobs just follow the skill tree as you level up having you use whatever skill you just learned then moving on to the next skill. Beyond these phone calls and debt story, there is not much of any writing. 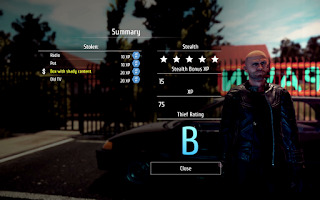 The only other npc you interact with is a pawn shop owner who has no rules against buying stolen items. However, he is just a shop without any characteristics. There are some funny puns spread out the game, primarily on your computer at home, but writing in this game for the most part is just not found. Repaying people for bailing you out is an acceptable enough story, but there is never any mention about how much or any event where the player makes payments. Just barely, a passable enough plot. Game play is surprisingly complex with some great ideas, but heavily flawed. The main focus is stealth which makes sense given the thief nature of the game. Home invasion is the only form of burglary found here, no stores or banks. Only one location as well, that being Greenview Street. An odd name considering it is a small town rather than one street. Despite only having one major aspect of game play, a lot of depth has gone into it. Every civilian has a daily schedule they follow religiously that determines when they will or will not be in their house. Each house has different weak points and security levels arranging from locks and alarms. 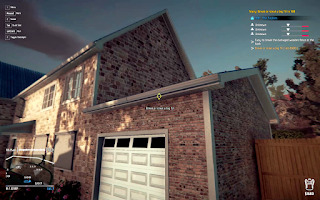 The quality of the house gives a hint on how difficult it will be to break into; as nicer houses have more security but better stuff to steal. 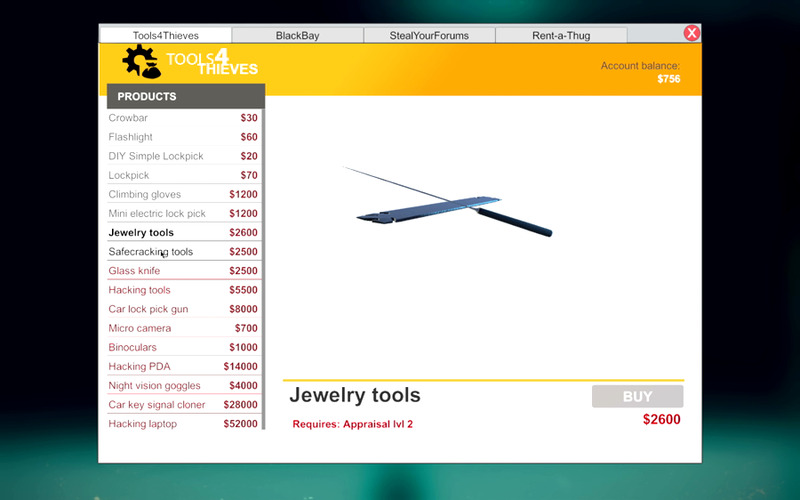 There are specific items to steal given by the story but any additional stuff awards money and experience points. There is no combat in the game and getting caught by the police or a home owner with a gun results in an instant game over. 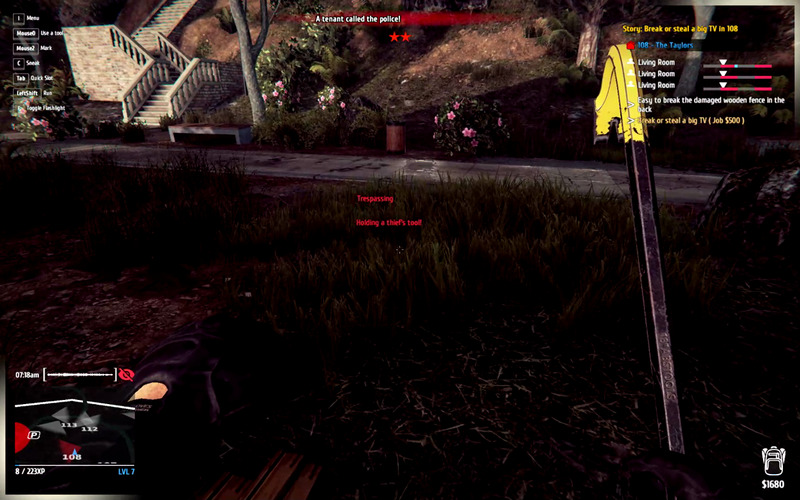 Attacking anyone with a crowbar or your car will also result in a game over. Many things in the game can get you caught in order to add balance and challenge for the player. Getting spotted crouching or holding a crowbar can arouse suspicion among any civilian who sees you. This is known in game as "suspicious activity". Naturally, getting caught trespassing, picking locks, or stealing will result in the police being called. When police are called, the player has the option to either hide or flee the town. Every time the player leaves town with stolen items, they are given rank based on their performance as a thief. These ranks are based on stealth and the value of whatever was stolen. A high award experience points used to level up and learn new skills. Skills arrange from convenience such as increasing carrying weight or movement speed when carrying a large item, to mandatory skills like lock-picking and breaking down jewelry. 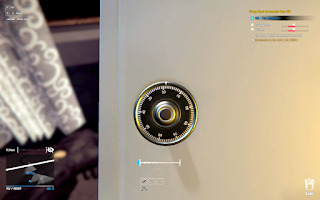 Every level of skills like lock-picking as a different mini-game that eat up time and leave you exposed to getting busted. This time management system is actually a very nice way to build tension and give a sense of urgency in the game. 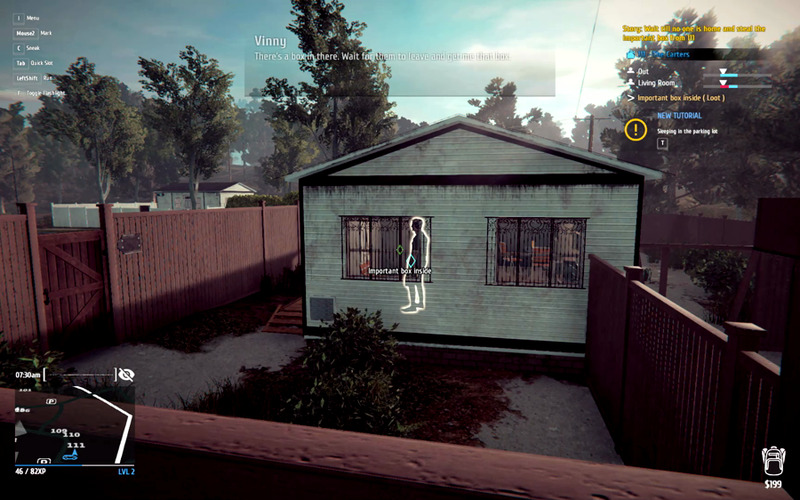 Story missions will typically have you after a specific item item in a house to either break or steal. In-between those missions, there are side jobs that can be accepted on the computer at your base under the Rent-a-Thug tab. 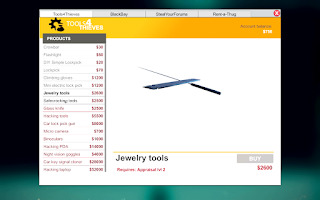 The other tabs are used for purchasing hints about houses (StealYourForms), selling specific items or groups of items at a higher price than the pawn shop would pay (BlackBay), and purchasing new burglary tools allowing for more ways to get past security (Tools4Thieves). Unfortunately, this mechanic of acquiring skills and tools brings us to the first major problem with this game. In an attempt to extend the play time, main missions become locked until acquiring the right tool and skill. Every new skill has a tool that needs to be purchased in order to use it and the main missions plus the side jobs alone are not enough to cover the cost. This leads to robbing the same houses you are already skilled enough to break into repeatedly until the correct amount of funds and experience is gained. A forced form of level grinding is used which is one of the worst ways to stretch out a games length. 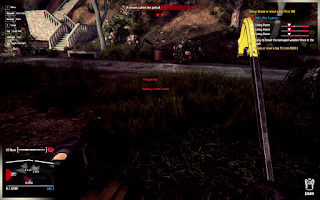 The other big issue with this game would be the large amount of exploits with the mechanics. As previously mentioned, there are a good number of ways to get in trouble with the law and one of them involves where you leave your car. Normally, the car is used for passing time, extra storage, carrying items too big for the normal inventory like TV's or paints, and it is supposed to be for escaping the city. Parking the car on the street, sidewalk, or a residents driveway will result in it being towed. 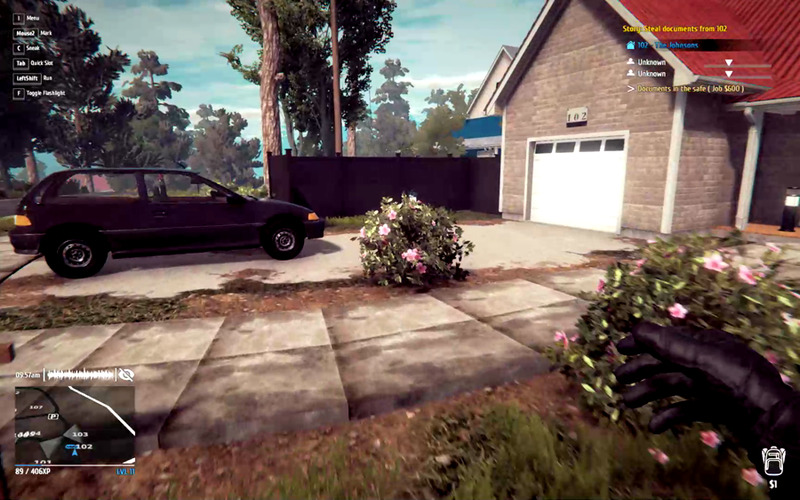 However, parking in-between the fence of a house and the sidewalk does not trigger the penalty. There also isn't any reason to use the car for escapes other than carrying a large stolen item. Sprinting out of town is barely slower, easier to navigate, and their is no penalty for leaving your car behind. On the topic of lack of penalty, getting a game over from attacking people does not really penalize the player. The only thing that happens is you are forced to load your checkpoint so most of the time, this will be done on purpose in order for an easy do-over if something goes wrong. One final big exploit is that police are too easy to avoid. Hiding places can be in dumpsters, under beds, or in closets to name a few. As long as no one is looking directly at you when you use a hiding place, you will never get found. Police give up the search for you very quickly and even if you cannot hide they are easy to out run even on foot. Adding insult to exploit, the stealth mechanics are poorly programmed. I was caught by a resident three times in their house and hid from the cops each time without ever leaving the house. Alert levels never raise beyond the two starts they start at and only go down. Another issue is that the cops always know it was you who robbed a house and what area you are in even if no one saw you. Getting in and out of a house undetected will still result in police being called eventually when the people notice their stuff is stolen, which makes sense. The issue is that they will go straight to your location instead of the house that was robbed because of the problem where they always know your location. It was very weird to see cops get a call about a house breaking and rush to the neighbors house first to search it where I was hiding. 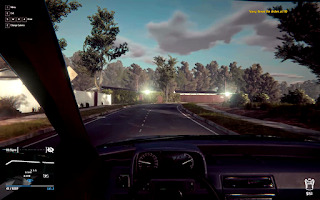 Overall, the game play had some very good ideas but still need a lot more polishing. There is not much to talk about in terms of audio. 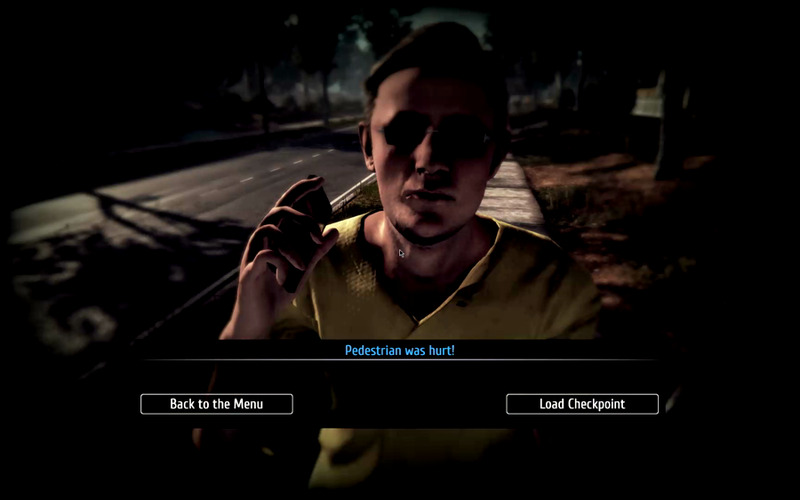 The game is voiced, but Vinny is the only one with any dialog beyond a greeting or scream. Sounds effects all match what they are assigned too. Music is scares. 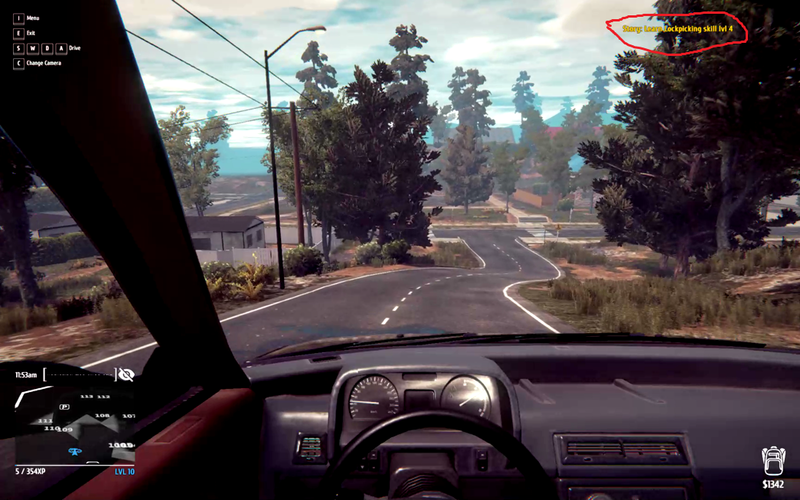 During loading screens and the radio on your car are the only times that any background music is play. This is not necessarily a flaw because the silents fits the sneaking thief nature of the game. For what it is, nothing is wrong with the audio, it is just enough to get the job done. Visually, the game looks great. Everything is nice, bright, and colorful and the lighting for the different times of day look very natural. 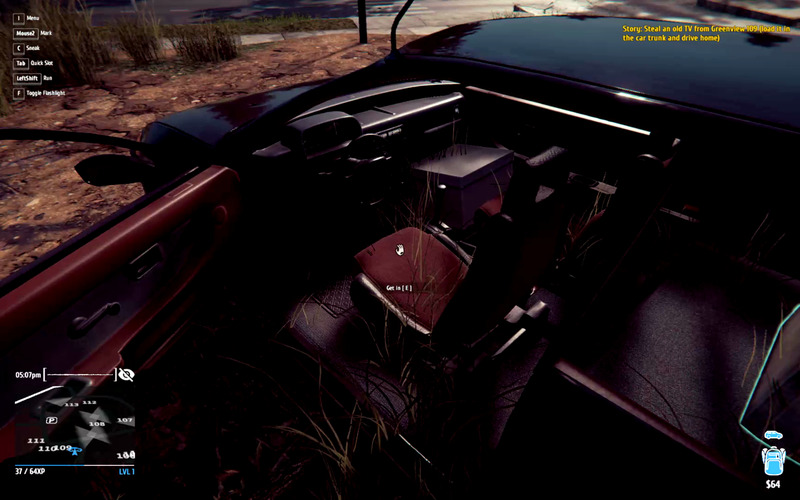 The only issue I had with the visuals was when the grass poked through the bottom of the car. Thief Simulator is a game with a lot of great ideas, but sadly feels unfinished as of writing this review. I was honestly having a really good time playing this until the pacing came to an abrupt stop behind a wall of level grinding. The lack of variety only makes the repetitive nature of farming for money and experience even worse. Although, given that this game is still being updated, I will hold off on calling it a wasted opportunity. If the mechanics are cleaned up and more things to do are added in future updates (like using the money for things other than ways to make more money) than I could call this a gem. As it is now, it is not great but I would recommend following it for a more complete version down the line. I see people play stuff like this on youtube from time to time. Looks like it would be fun.